Contrary to popular belief, psychology is not an objective field of study. A person’s or a people’s psychology is culturally specific; thus when people attempt to explain a particular person’s/people’s psychological health, one must take into the account the person’s/people’s history/philosophy/worldview. Ever since Europeans massacred their way to global dominance, the conventional wisdom is that Western thought is correct for everybody. So when examining so-called “universal” psychological heuristics to measure health, what you are looking at is Western cultural imposition dominating the minds (and bodies) of those they subjugate. 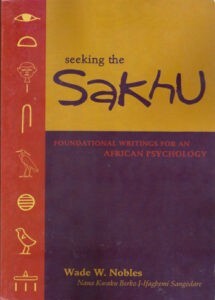 This is the primary point Dr. Wade W. Nobles makes in his book Seeking The Sakhu: Foundational Writings For An African Psychology. This book is a collection of Dr. Nobles’s writings from the 1970’s through 2000’s that are dedicated to liberating the African mind. Throughout the book Dr. Nobles demonstrates how important it is that African people distinguish between themselves and their colonial oppressors (be they European or Arab), in order to rebuild an African worldview. Rebuilding an African worldview is ultimately needed t0 continue the much needed task of African nation-building. So much can be said about this book, but it’s most valuable if you check it our yourself!